Having grown up in rural Ontario, I first discovered the joy of writing while attending a one-room school house. My parents were mink ranchers who worked very hard to ensure that our family never wanted for the necessities of this world. We had chores aplenty to do on our farm, but my imagination was given free rein. As a young girl I would spontaneously compose poetry while riding horses that my father boarded for the winter from a nearby riding academy. My Aunt Margaret McDonald played an especially important role in fostering my early appreciation for poetry. She would often send me inspiring quotations and poems that touched my heart. Throughout the years, some of my poems have appeared in poetry anthologies, newspapers and professional publications. In each of my varied employment positions, my talent for writing inevitably surfaced and I found many diverse venues for the expression of my thoughts. My first self-published compilation was the creation of a manual for teachers which documented the seven-week programs I had designed for fostering poetry appreciation through The Precious Gems Poetry Club. I would use many of my own poems to illustrate the use of poetic elements. 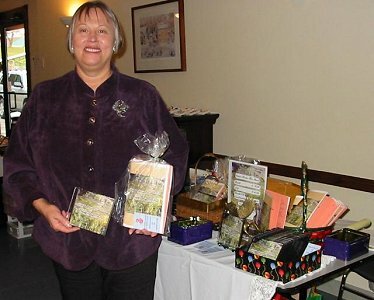 November 20, 2010 at Christmas "Stop and Shop"
In 2009 Shalamar Enterprises published a book of poetry for Joseph Edward Gould, a retired naval officer who lives in Fairhope, Alabama. While spending the winter in that beautiful city, I had the pleasure of meeting Joe, hearing details of his remarkable career and reading the poetry he had composed over the course of his 90 years. I gathered up his poems, brought them back to Canada and published them in a book titled: "Another Time, Another Place - The Selected Verses of Joseph Edward Gould." Joe has currently sold all the copies from the first printing and we are planning a second edition of his work. Please visit my website for more details about this publication. Recently I have turned my focus toward publishing my own creations that have been accumulating for years while my path meandered in several directions. 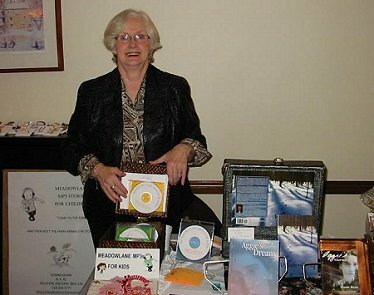 In the spirit of embracing my true identity as a poet, I have recently published a soft-covered poetry book and CD titled Water From The Moon. Plans are underway for additional CDs, books and DVDs, so I invite you to return often to my 'sight' for an update on the latest project!